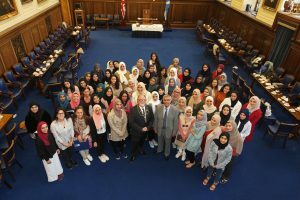 The 61 female students taking part in the Al-Maktoum College of Higher Education’s Summer School programme enjoyed a civic welcome at Dundee City Chambers today (July 17), on their first full day in Scotland. Depute Lord Provost, Bill Campbell, said: “Previous visiting groups have enjoyed their visit to Dundee so I hope these students will feel equally at home here. The group – from the United Arab Emirates, Egypt and Malaysia –spent last week in Oxford and London. This is the 24th educational programme of its kind since the first Summer School in 2003 and students who have taken part number well over 1,000. Professor Hossein Godazgar, Principal and Vice Chancellor of Al-Maktoum College, thanked the Depute Lord Provost for his warm welcome. The third and fourth-year students come from Abu Dhabi University; American University in Dubai; College of Islamic and Arabic Studies; Higher Colleges of Technology; British University in Dubai; University of Malaya, Kuala Lumpur; Zayed University; Cairo University; American University of Sharjah; Hamdan Awards for Distinguished Academic Performance; UAE University; Abu Dhabi Police Academy; University of Sharjah and Paris-Sorbonne Abu Dhabi University. Picture shows Depute Lord Provost of Dundee, Bill Campbell with Professor Hossein Godazgar, Principal and Vice Chancellor of Al-Maktoum College of Higher Education and overseas Summer School students at the City Chambers.